Description Of Item: For the first time almost 20 years, there is a brand new Predator film featuring a whole new breed of Predators! These hunters are even more ruthless and deadly than the Predators that came before. 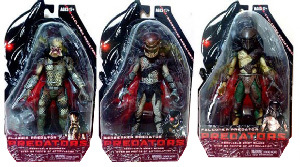 Fans of the series will want these figures of the Classic Predator, the Falconer Predator, and the Berzerker Predator. Each figure stands over 7" tall and is fully poseable. Blister card packaging.